A chronological history of Art Matters activities. Art Matters began as the brainchild of philanthropist Laura Donnelley, who wanted to assist artists struggling to say something with bite and punch, artists who made “art that mattered.” Incorporated in 1985 as a non-profit private foundation, Art Matters’ mission was to support experimentation in art, both in media and ideas. Donnelley assembled a board of professionals in the field with breadth and diversity of knowledge, and provided the operating and grant money for the first six years. Art Matters gave fellowships to individual artists and, to a lesser degree, funding for the organizations that sponsored and presented new work, most often the alternative and artist run spaces. The foundation tried to make it easy for artists to apply by eschewing lengthy applications, and made the turn-around time for receiving funds as short as possible. Art Matters chose to give small grants to many artists rather than larger ones to fewer. Need was simply assumed, and promise, rather than accomplishment, was the issue. 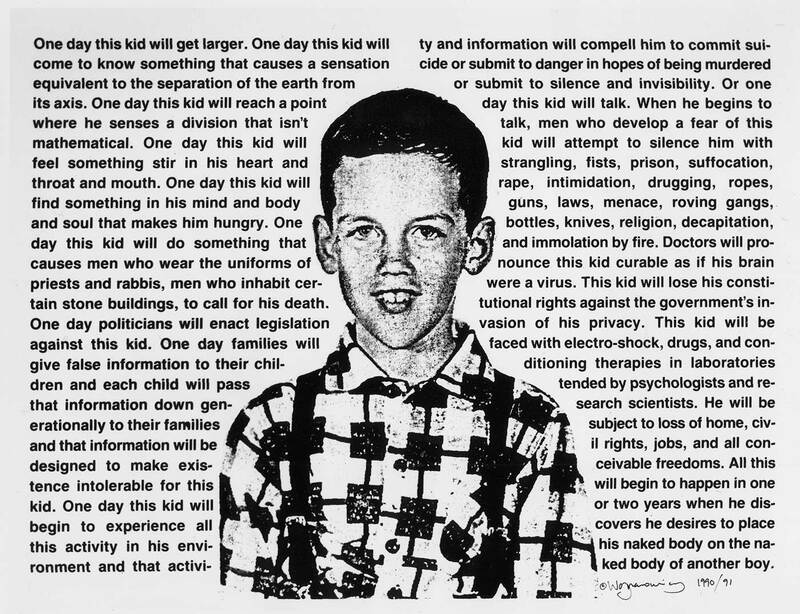 David Wojnarowicz, Untitled, 1990. Photo courtesy of the Estate of David Wojnarowicz and PPOW. Art Matters grant recipient, 1989, 1990, 1991. Lorna Simpson, Stereo Styles, 1988. Photo courtesy of Josh Baer Gallery, New York. Art Matters grant recipient, 1991. When conservative groups started taking pot shots at art in 1989, their wrath was often directed toward precisely the younger, more experimental and more vulnerable artists that Art Matters had been funding. Art Matters responded to the government defunding and threat of censorship by making particular effort to aid artists who message was endangered by the chilling effects of the culture wars. Art Matters became a participant in the activism of the late 1980s, supporting strong statements and actions intended to protest and to produce change. The foundation gave seed money to a number of organized efforts that directly challenged the government’s position on cultural funding and AIDS, including the National Campaign for Freedom of Expression and Visual AIDS. 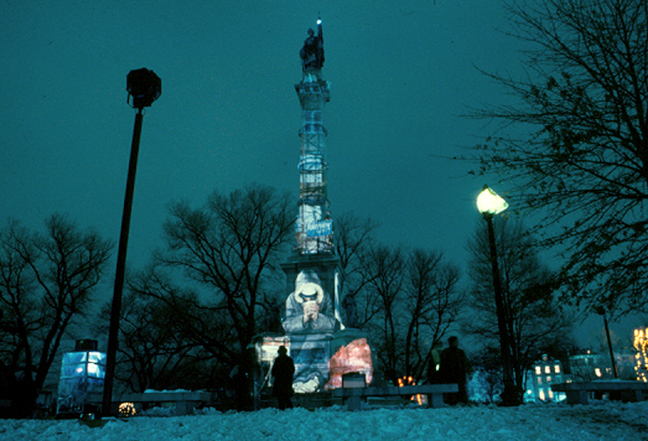 Krzysztof Wodiczko, Soldiers and Sailors-Boston, 1988. Photo courtesy of Gallery Lelong. Art Matters grant recipient, 1988. Although Laura Donnelley understood the foundation’s ardor and stood by it, the oppositional stance that Art Matters forged during that time was difficult for her. In 1991, she refocused her giving and turned the foundation over to the board, leaving it with an endowment to support ongoing work. Though a tremendous act of generosity, the endowment wasn’t large enough to sustain Art Matters on its own. The foundation sought additional monies for its fellowships by encouraging foundation colleagues to use Art Matters as a conduit for making grants to individuals if they were neither mandated nor legally structured to do it themselves. Additionally, it sought contributions from the broad public, initiating a number of professional mass mailings, inviting contributions of any size. As these ventures produced only limited success, Art Matters decided to respond to the public sector challenge to non-profit organizations to adopt the practices of the entrepreneurial world. 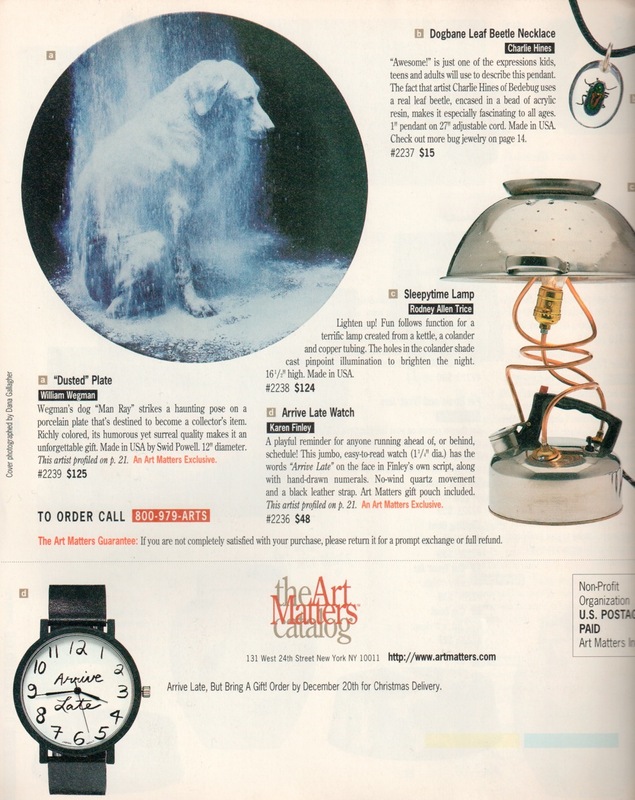 In 1994 Art Matters invested its endowment in the creation of a mail order catalog of artist-made objects to raise the revenue necessary to maintain and even expand its grants program. Many artists designed a wide range of products that Art Matters produced. Though the initial mailing of 1.2 million copies of the Art Matters Catalog made impressive returns, the income was insufficient to capitalize the new business for ensuing seasons and outside investors were hard to find. Back page of the Art Matters Catalog 1995. Due to lack of funds, Art Matters went on a hiatus from grant making starting in 1996. By that time, the foundation had given over $2 million to almost 2000 artists. 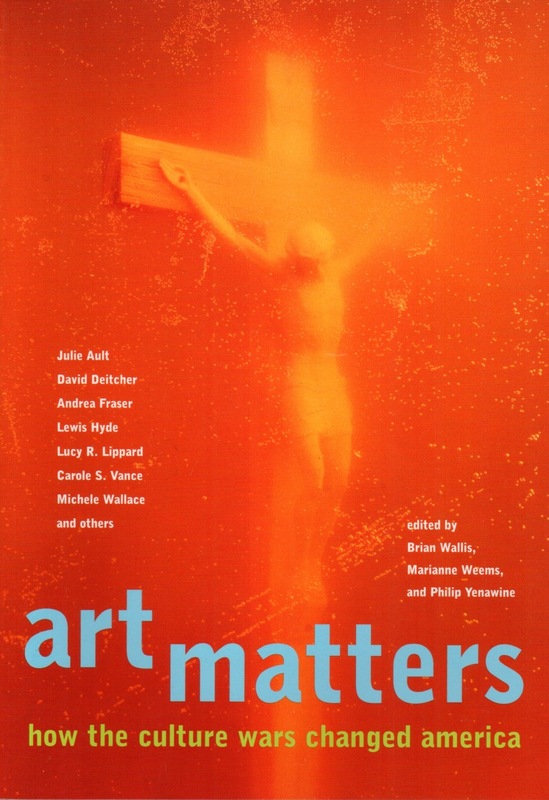 In 1997, with help of the Lannan Foundation, the foundation produced the book Art Matters: How the Culture Wars Changed America, a collage of pieces addressing art in the 1980s and ’90s. In 2005, Laura Donnelley and the board decided to reignite Art Matters’ grants program. Since 2007 the foundation has again been supporting a broad range of artists who are pushing aesthetic and social boundaries. 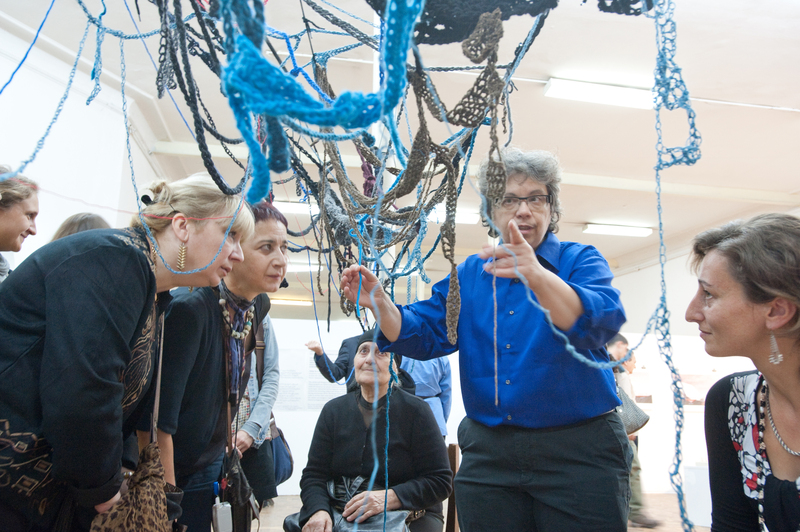 Art Matters has given over 300 grants to US artists for fellowships and collaborative projects all over the world. Bryan Jackson, Juicy Menu | Akira the Hustler, 2007. Photo courtesy of the artist. Art Matters grant recipient, 2007. Shaun El C. Leonardo, El Debut de El Conquistador – Lucha Libre at La Curtiduria, Oaxaca, Mexico, 2008. Photo courtesy of Murcio. Art Matters grant recipient, 2007. Sheila Pepe, Common Sense Tbilisi, 2010. Photo courtesy of the artist. Art Matters grant recipient, 2011.